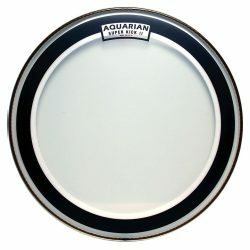 The Aquarian Modern Vintage II with Super-Kick Ring is a warm and controlled bass drum head, giving a deep focused punch without overtones getting in the way. 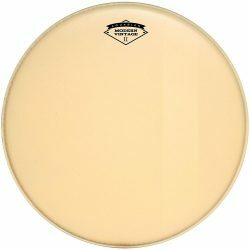 If you’re looking for a quick, warm, and fat bass drum sound, this is a great choice. The Aquarian Modern Vintage II with Super-Kick Ring is made with two 7mil plies, a special-coated top layer, and an added felt muffle ring adhered to the inside of the head (the Super-Kick muffling ring). The felt muffling ring is partially glued to the drumhead, allowing part of it to “float” more freely as the head is struck. 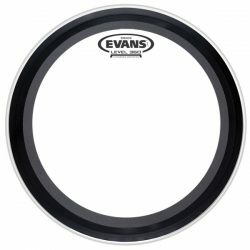 The floating feature of the ring means that it won’t choke the drumhead too much, which keeps some liveliness in the overall sound. 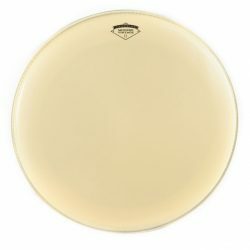 The Aquarian Modern Vintage II with Super-Kick Ring is a thick and focused 2-ply drumhead, with extra warmth and no ringing overtones. Thanks to its unique coating, the Aquarian Modern Vintage II has an excellent warm sound. Designed to have the look, feel, and sound of calfskin, the special coating gives a much greater emphasis to the midrange and low-end frequencies. Higher pitch tones are greatly reduced, which leaves a very warm overall sound. The vintage coating makes the attack more subtle and a little punchy, again with a strong focus on the warmer side of the sound spectrum. 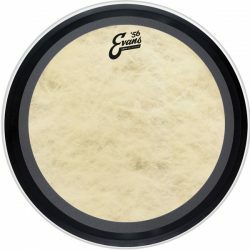 The Modern Vintage II’s Super-Kick felt muffle ring adds a great amount of control to this bass drum head. Overtones are entirely removed, leaving you with no strange ringing after the head is struck. The sustain is short, creating an overall sound that is quick, deep, and punchy. Along with the Vintage coating, the Super-Kick ring also helps to reduce higher pitch frequencies, contributing to the very warm and focused sound. 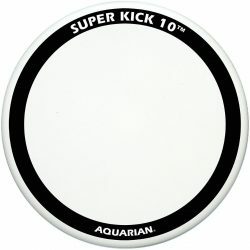 Aquarian Drumheads Modern Vintage II Drumhead Prepack - 10", 12", 16"
The double-ply design means the Aquarian Modern Vintage II with Super-Kick Ring is durable… The thicker design means you’ll be able to hit hard to get a big sound when needed. Compared to the thicker Deep Vintage II with Super-Kick Ring, the Modern Vintage II is a little more responsive, which also makes this head more usable at moderate-lower volume levels. 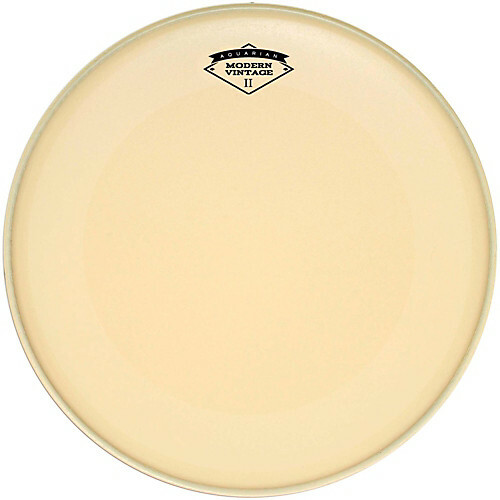 The Modern Vintage II’s thick design also contributes to this drumhead’s warmer and more focused sound. While usable at some lower volumes, this drumhead really shines in medium to higher volume drumming. When hit with some force, this head gives a great sound. It should be noted, however, that the warm sound and more subtle attack can get lost in extremely high volume conditions. If you’re worried about this, add a click patch or use a microphone on your bass drum. The Aquarian Modern Vintage II with Super-Kick Ring is a great option if you need a short sustain with no ringing overtones. 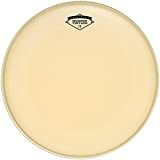 Compared to the Felt Strip version of the Modern Vintage II, this bass drum head has slightly less sustain and ringing – the Super-Kick ring provides more dampening than the felt strip. 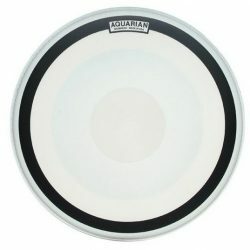 This head is a great middle ground in the Aquarian Vintage range: more durable and controlled than the single-ply Modern Vintage drumheads, and more responsive than the thicker Aquarian Deep Vintage range. The Modern Vintage II is great for drummers looking for a punchy, focused, and very warm sound.